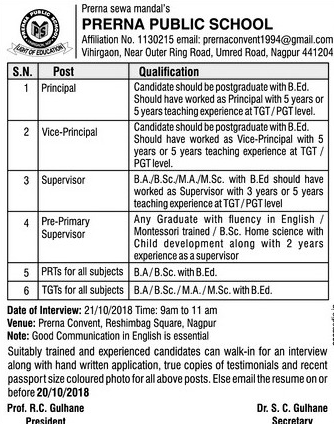 Prerna Public School, Nagpur has advertised in the LOKMAT newspaper for the recruitment of Teachers TGT / PRT / Principals jobs vacancies. Interested and eligible job aspirants are requested to walk-in on 21st October 2018. Check out further more details below. For Other Positions, please see in the advt copy attached below. How to Apply: Interested and eligible candidates are requested to attend the Walk-in interview along with hard written application, the copies of certificates of education qualification / experience and recent PP size photos to the following walk-in address.